Cosmetic dentistry is the general term used to describe the treatments and practices utilized in the aesthetic improvement of one’s smile. In other words, cosmetic dentistry makes your smile look better. We offer top-quality cosmetic dentistry procedures right here in one comfortable and convenient location in Anchorage, AK, while also serving the surrounding areas. Below is a list of popular cosmetic dentistry procedures with a link to their corresponding pages (if you would like more information). DENTAL CROWNS | A dental crown is an artificial replacement for the visible portion of your tooth. Our world-class dental crowns look and function just like a beautiful, natural tooth. DENTAL BRIDGES | A dental bridge is a series of connected dental crowns which fill in a gap in a smile. They are anchored to neighboring teeth for strength and stability. TEETH WHITENING | Teeth whitening is one of the simplest and most effective ways to dramatically improve the look of your smile. It’s also one of the least expensive cosmetic dentistry procedures. DENTAL VENEERS | Dental veneers are often referred to as “instant orthodontics” and are one of the most popular cosmetic dentistry procedures. A dental veneer is a thin, synthetic tooth “face” which is affixed to the front of a tooth to alter the tooth’s shape, color, and general appearance. DENTAL IMPLANTS | In the past, when a tooth was lost, there was no way to replace it. 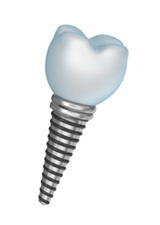 A dental implant is an alloy tooth root which, when placed, acts as a sturdy tooth root replacement. INVISALIGN | Invisalign is a popular alternative to traditional braces. Clear teeth trays are used instead of wires and brackets to gradually move teeth to the desired alignment. For all Alaska residents, contact us today to learn more about our cosmetic dentistry services and schedule a visit. We look forward to meeting you!